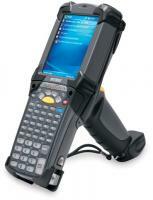 MC9090-G, Configuracion Pistola, 802.11a/b/g, Imager, Color, 64/64MB, 53 key, Windows CE 5.0, Bluetooth. MC9200, Pistola, Wi-Fi (802.11a/b/g/n), Laser 1D Largo Alcance - Lorax (SE1524), Pantalla Color VGA, 1GB RAM/2GB Flash, 53 (5250) Teclas, Windows CE 7.0, Bluetooth, IST. MC3200, Pistola, Imager 2D, Android Jelly Bean, 48 teclas Keypad, Wi-Fi (802.11a/b/g/n), Bluetooth, Bateria Alta Capacidad, memoria Expandida..
Falcon X3+, Escaner Laser 1D Alto Desempeño, 52 teclas Keypad Alfanumerico, Pistola, Sin Camara, Windows CE 6.0, QVGA Display, Bluetooth/Wi-Fi (802.11a/b/g/n), Standard memoria..
Skorpio X3, Pistola, Wi-Fi (802.11a/b/g), Bluetooth, 50 key Alphanumeric, Standard Laser con Green Spot, Windows CE 6.0. MC92N0ex, Configuracion Pistola, 1D Laser Lorax, 53 teclas. XG3, Pistola, Wi-Fi (802.11a/b/g/n), WEH 6.5, 512MB/1GB, 2D, 57 teclas, 5200 mAh bateria..
MC9200, Configuracion Pistola, Wi-Fi (802. 11a/b/g/n), 2D Long Range Imager (SE4600), VGA Color Screen, 1GB RAM/2GB Flash, 43 teclas, Windows CE 7. 0, Bluetooth, IST. Interface cables y charging cradle sold separately. para Single Slot Charging Cradle Kit (Part# CRD9000-110SES). para 4 Slot Charging Cradle (Part# CRD9101-4001CR), fuente de poder (Part# PWRS-14000-241R), DC cord (Part# 50-16002-029R) y AC line cord (Part# 23844-00-00R)..
OmniiT15, XT15 Standard, 3.7" Extreme Duty VGA (640 x 480) Display, 512 Mb / 1 Gb Flash, Windows CE 6.0, Ingles, 59 key, Alpha ABC, Teclado Numerico telefonico, 6 Function single push, WLAN 802.11a/b/g/n, Bluetooth 2.0+ EDR, 2D SE4600 Long Range Imager, Standard 5000 mAh Battery, Pistola, Tethered Stylus..
Workabout Pro 4, Wi-Fi (802.11a/b/g/n), Escaner Laser 1D, Windows CE 6.0, Bluetooth, Pistola, Long Alphanumeric Keypad, Bateria Extendida. Interface cables y charging cradle sold separately. Single slot charging cradle (Part# WA4003-G3). Quad charging cradle para long configuration (Part# WA4204-G3) require (Part# 23844-00-00R). Quad charging cradle para short configuration (Part# WA4304-G3) require (Part# 23844-00-00R)..